Introducing the Arrowmat self healing foam rubber target face. Designed to complement any foam block target or other suitable backstop. Arrowmat Targets come in a variety of styles and are GUARANTEED to 1000 SHOTS! Arrowmat™ Targets provide archery enthusiasts with an exciting and cost effective alternative to the traditional targets of the past and are guaranteed to enhance your shooting experience. Designed to be used with any suitable backstop, these targets perform superbly as a replacement for paper targets or as an accessory to the ever popular foam block targets available today. Their self-healing foam rubber construction makes them extremely durable and resistant to the adverse effects of weather and general usage . Vibrant full color designs are created through a process known as ‘Dye Sublimation’ resulting in brilliant, photorealistic imagery that will never peel or flake away. And at a mere 13 ounces, ArrowMat’s light weight and universal size, combined with a convenient fastening system making it very versatile and easy to use. Affordable and convenient full-color durability all rolled up in a target that will fit into your bowcase make Arrowmat™ your BEST SHOT when choosing a target this year! Add New Life To Your Foam Block Target! Most foam block targets deteriorate from multiple hits and exposure to the elements. Arrowmat™ targets are a cost-effective way to enhance your target practice experience. With a 17" X 17" surface area, Arrowmat™ targets will conveniently attach to most standard foam block or other suitable back-stops. The optional convenient fastening system utilizes four brass grommets in each corner of the target ensuring fast and easy setup. Weighing a mere 13 ounces, Arrowmat™ targets can be rolled up and taken anywhere! Brilliant Full Color Imagery with no Flaking or Peeling! Arrowmat™ uses a full color dye sublimation process. Through the application of heat, images are permanently transferred into the micro-knit cloth surface. Arrowmat™ targets are UV resistant which provides protection from weather extremes with little or no fading of color. At the core of every Arrowmat™ target is an open-cell polyurethane self-healing foam rubber which provides an amazing degree of durability. 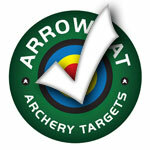 Arrowmat™ targets are designed and guaranteed to accept the punishment of over 1,000 shots! Extracted arrows leave little evidence of penetration, as the foam rubber expands back to its original form.